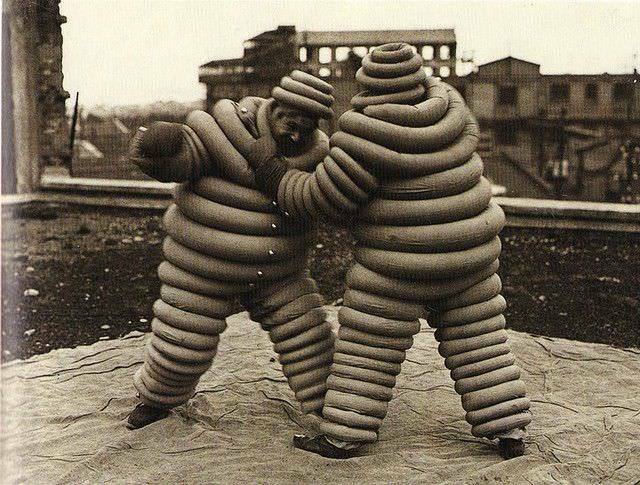 Michelin man style boxing in 1917. 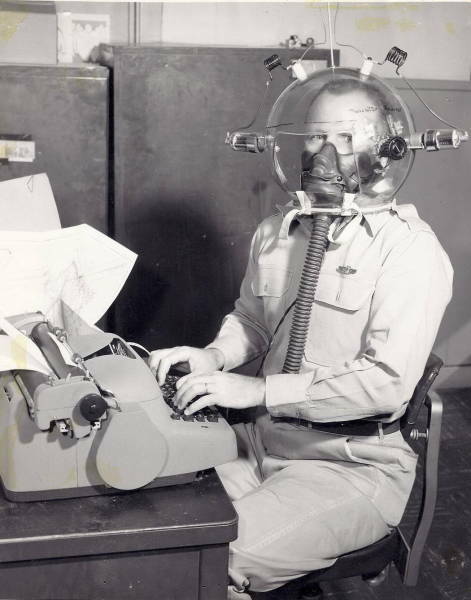 An experimental transmitter in the 1940s. 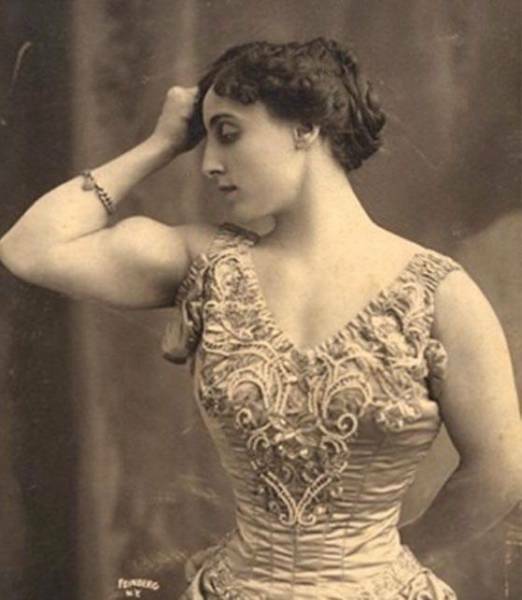 An early female body builder, 1890s. 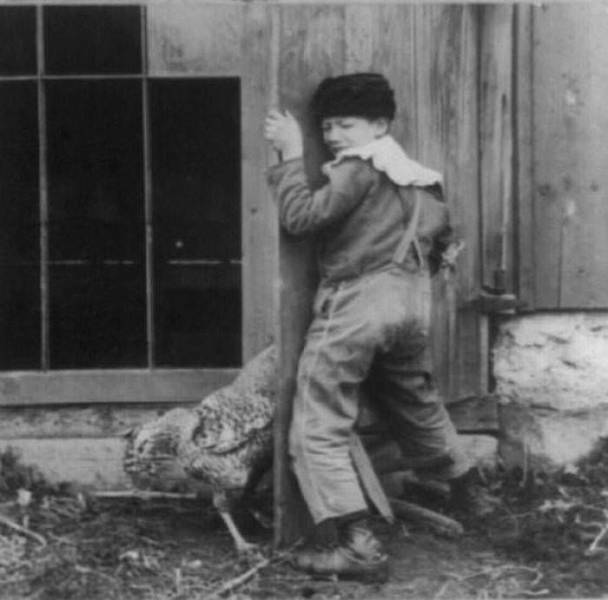 A boy hiding from a giant angry rooster. 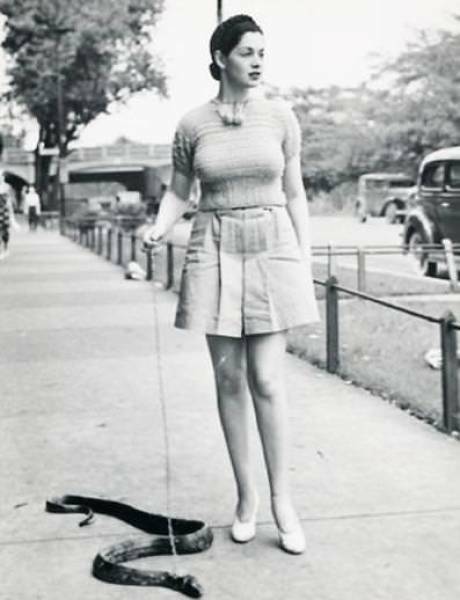 Walking a pet snake, 1930s. 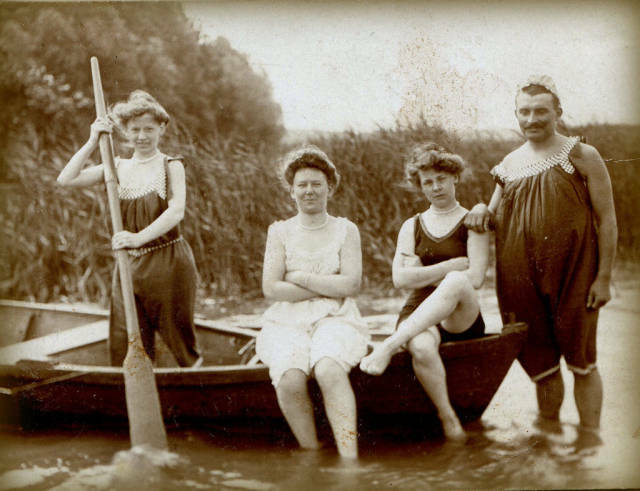 A family poses for a photo in 1910. 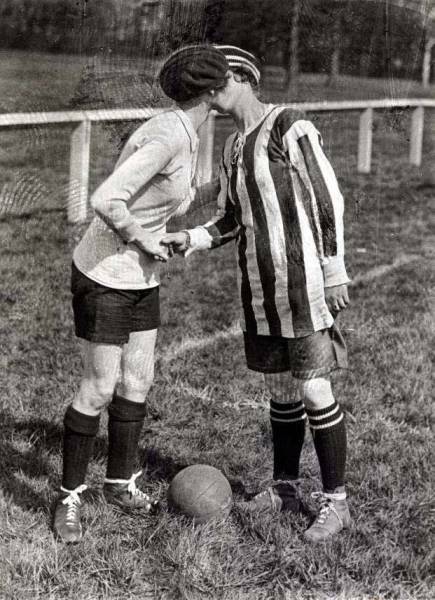 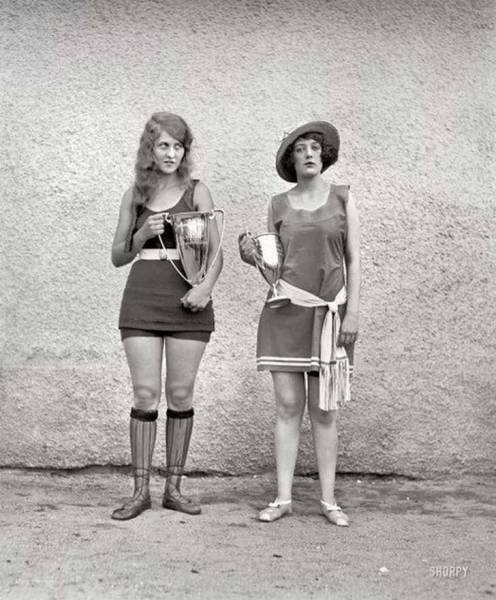 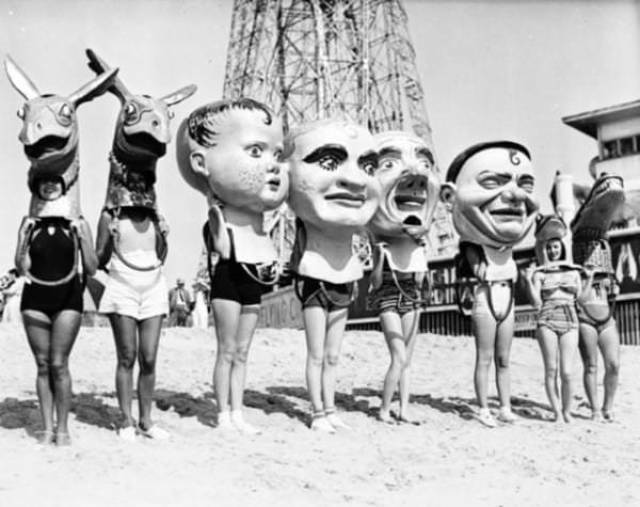 The winner and runner up of a beauty contest in 1923. 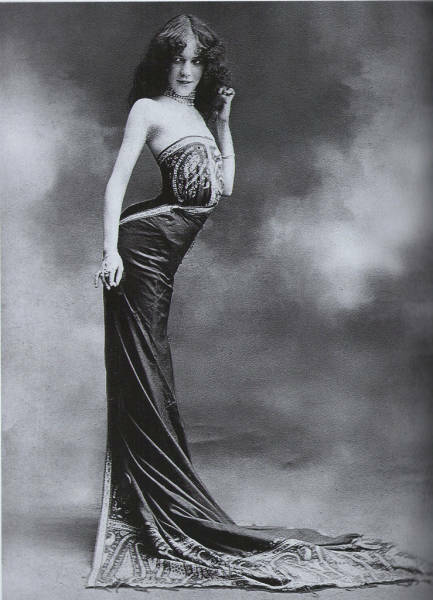 Contortionist Edith Lambelle Langerfeld in 1908. 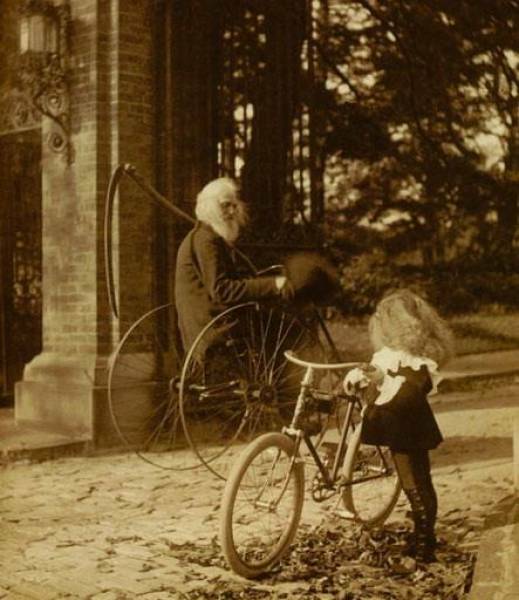 An old man riding a bike passes a young girl riding on hers. 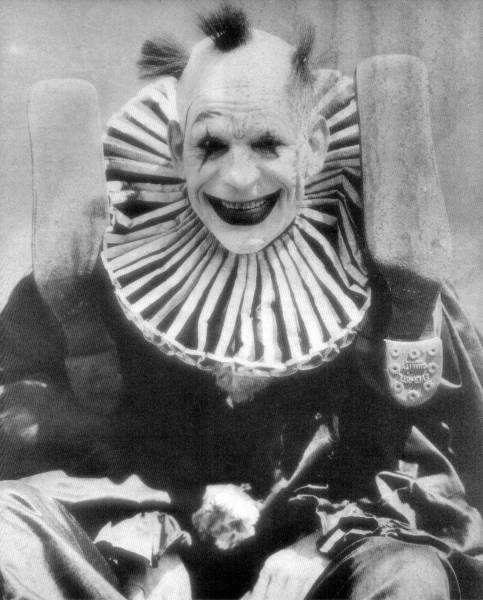 A picture of the Boogeyman to scare kids, 1922. 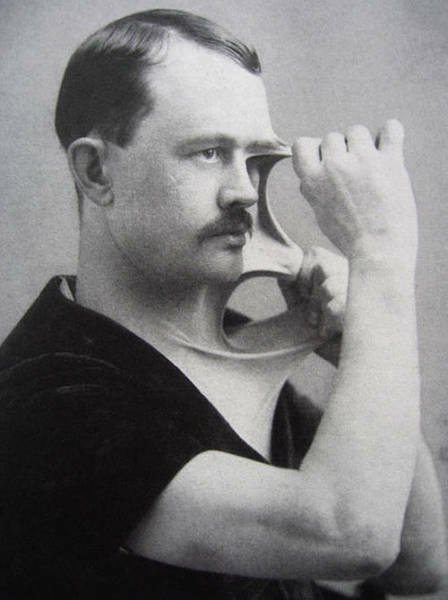 A man with that rare disease that makes skin super stretchy, 1904. 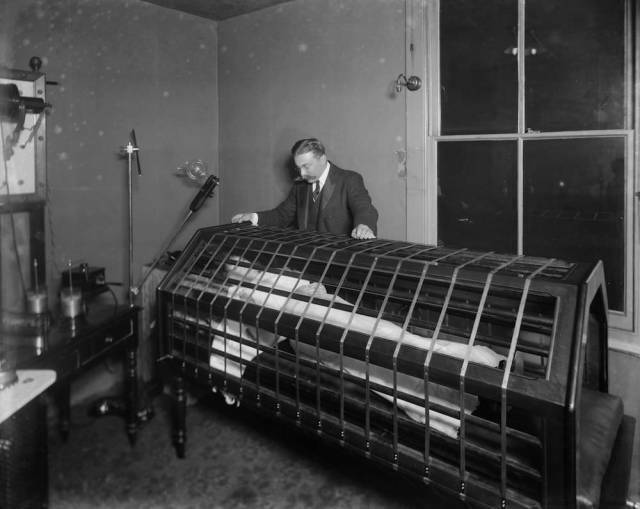 A woman inside an electric bath, or early sunbed, 1900. 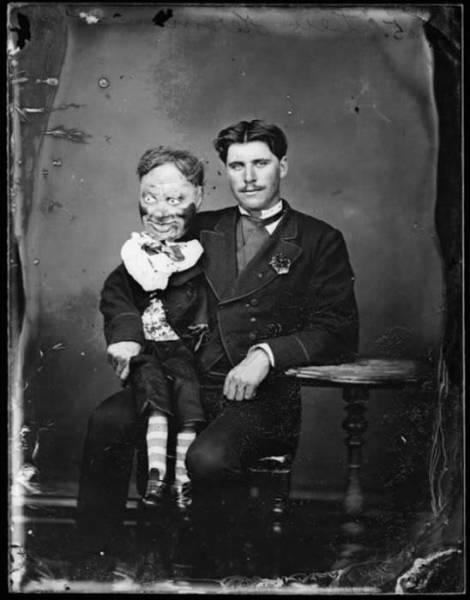 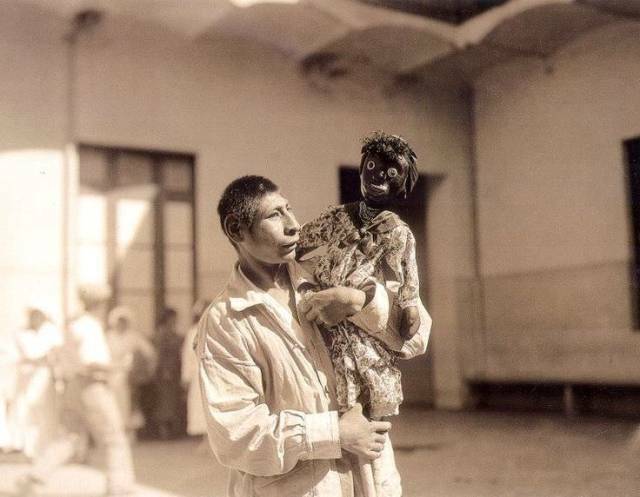 A mental health patient and his doll in the 1920s. 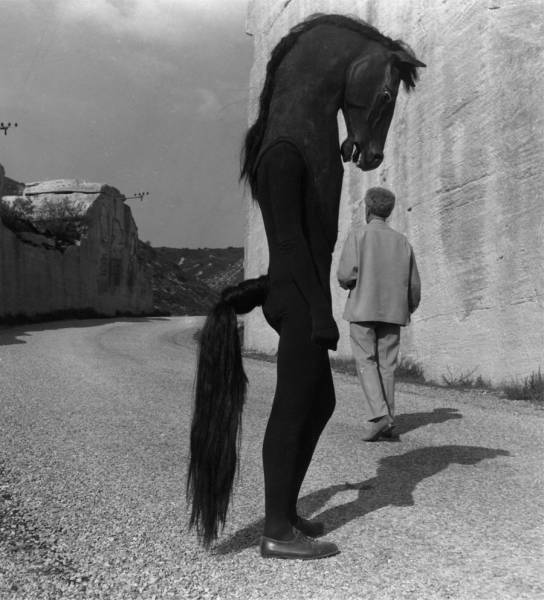 A man in a horse costume, Greece, 1961. 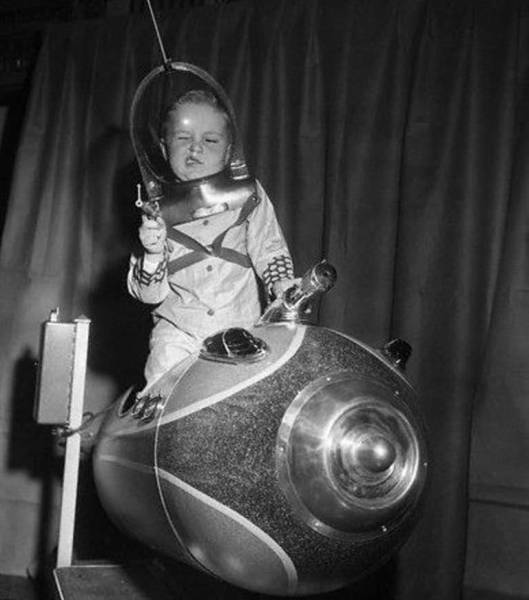 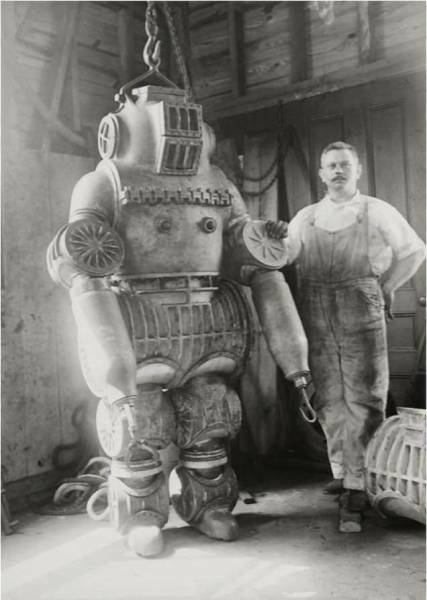 Chester E. MacDuffee and his patented diving suit, 1911. 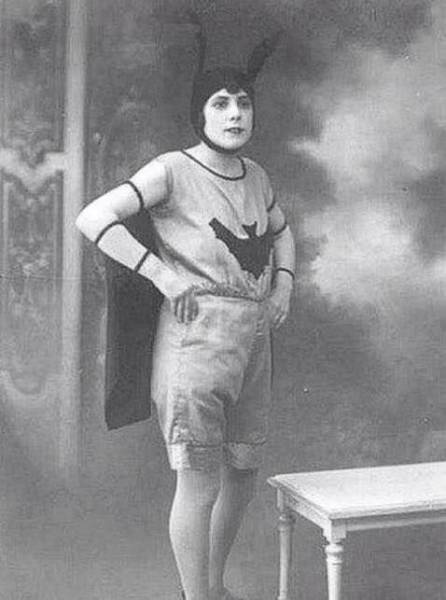 A woman dressed up as something similar to Batgirl, 1904. 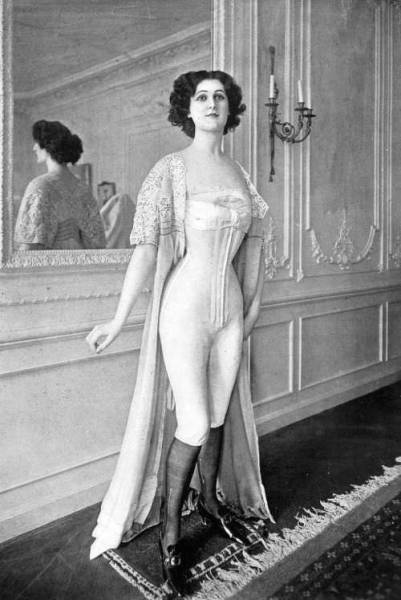 A woman models long john undergarments for women, Paris, France in 1901. 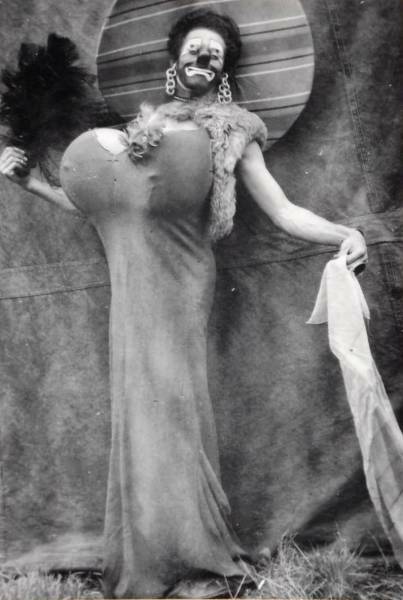 Photographer Cor Jarings picture which was created and designed to support the Provo Movement in Amsterdam, 1960. 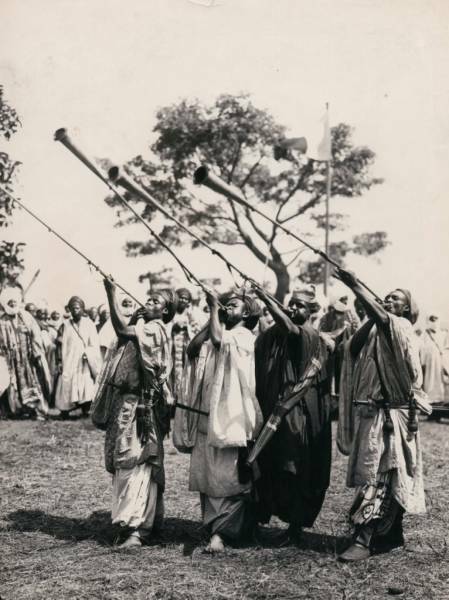 A West African tribe sounding their horns, 1896. 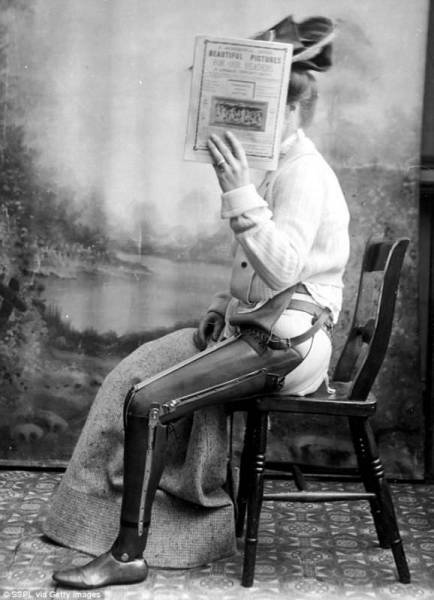 A woman hides her face but shows off her prosthetic leg somewhere in the US, 1890. 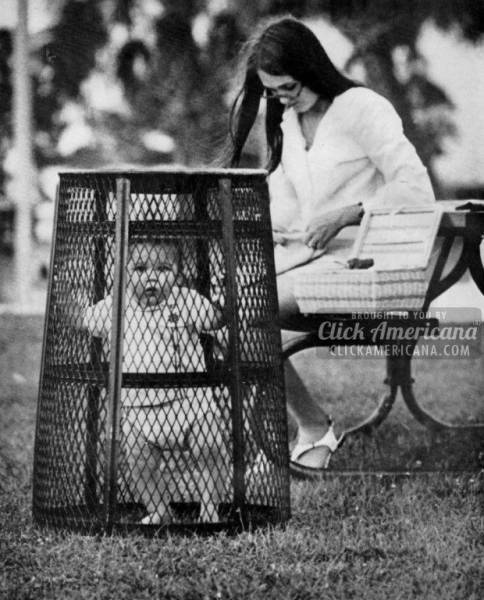 A mom uses a trash can to contain her baby while she crochets in the park somewhere in the US, 1969. 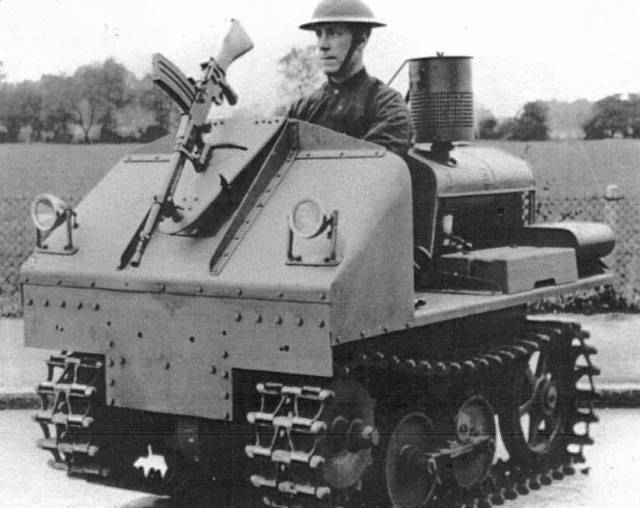 An experimental one man machine gun tank in England, 1934. 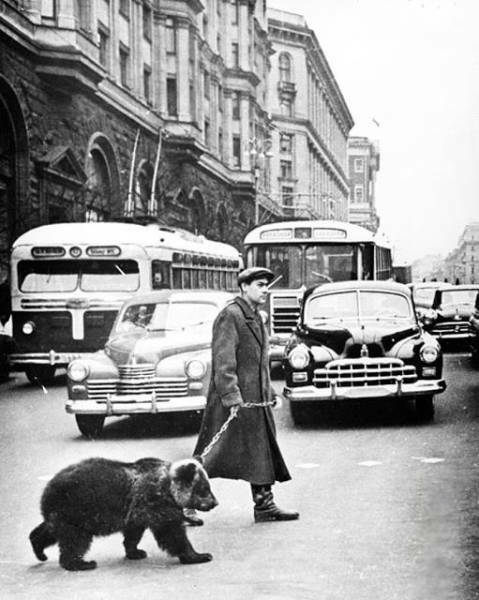 A man walks his pet bear somewhere in Russia, 1960. 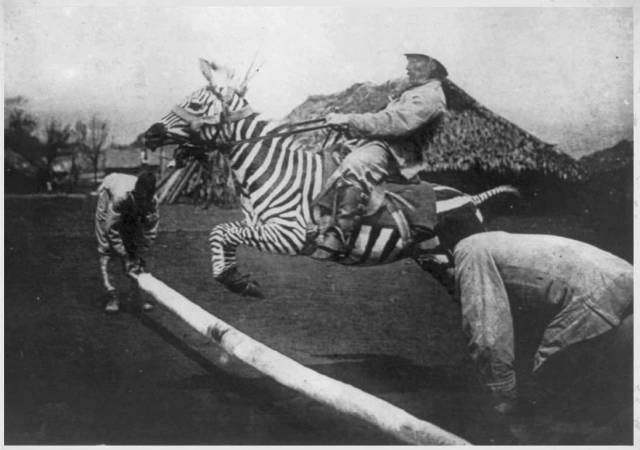 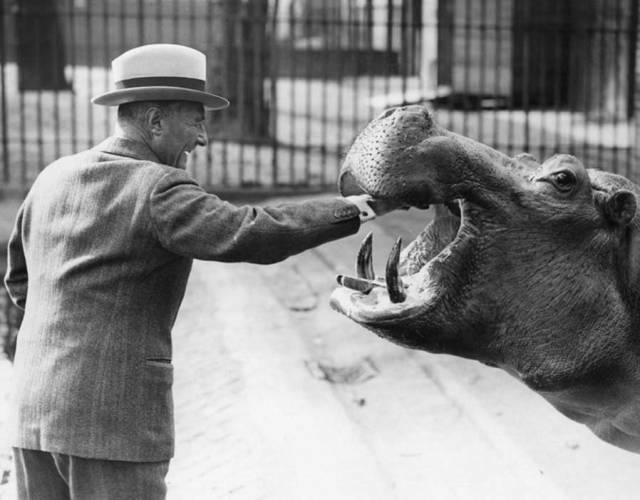 Doing tricks on a zebra for an event known as the Zebra Olympics in Tunisia, 1928. 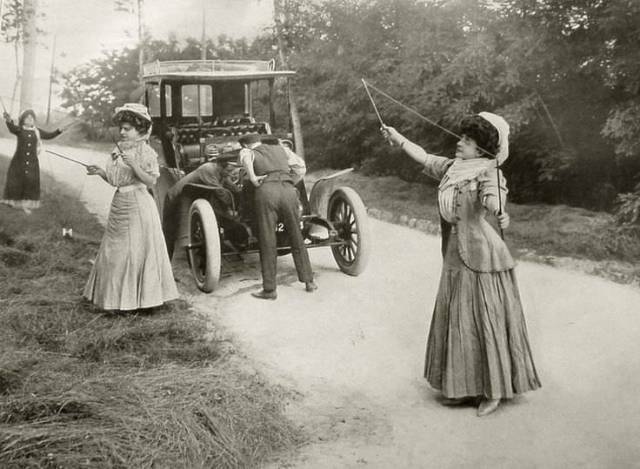 Three ladies play with toys while 2 men try to fix their car, England, 1908. 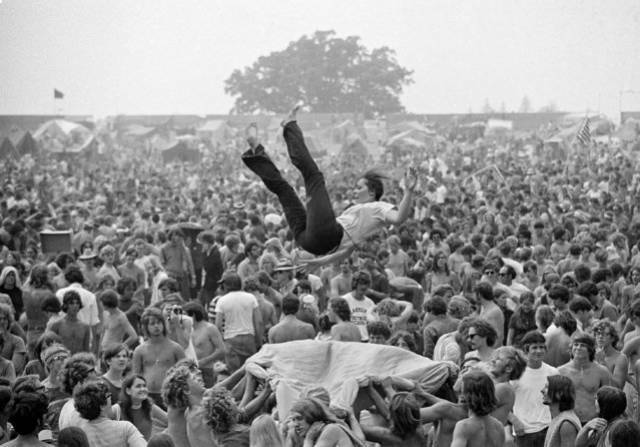 As concert goers wait for the rock music to begin, a group takes part in a blanket toss at the Goose Lake International Music Festival near Jackson, Mich., August 9, 1970. 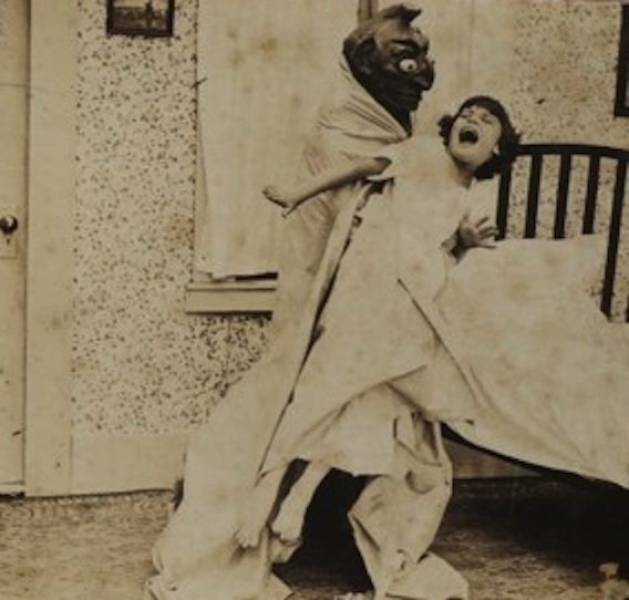 Here a young woman gets tossed in the air. 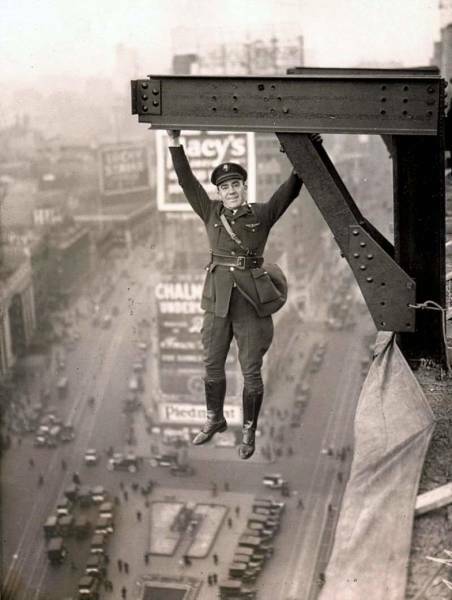 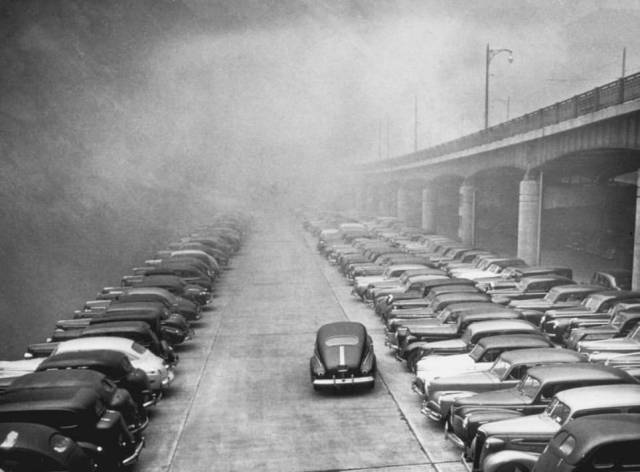 The crowd, numbering around 200,000, seemed to enjoy the three-day event which was free of incident. 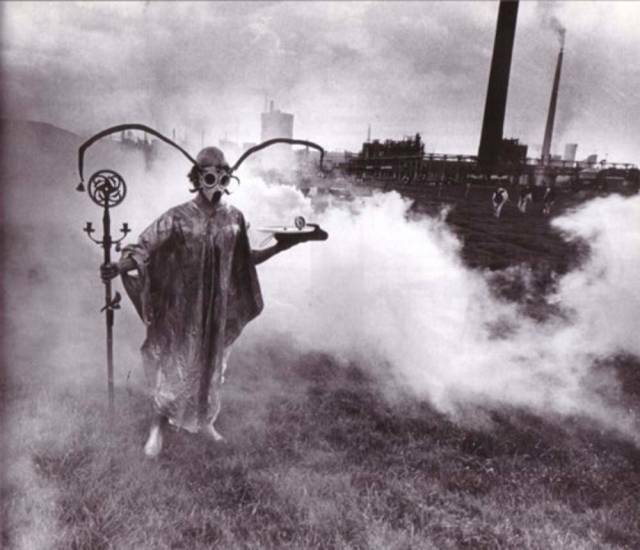 Dr. A.J. 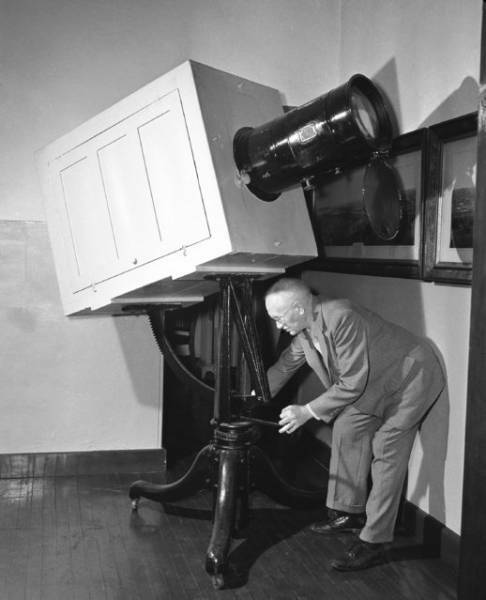 Olmstead of the Smithsonian Institution, adjusts the only known example of a “Woodward Solar Camera” in Washington, D.C., October 24, 1944. 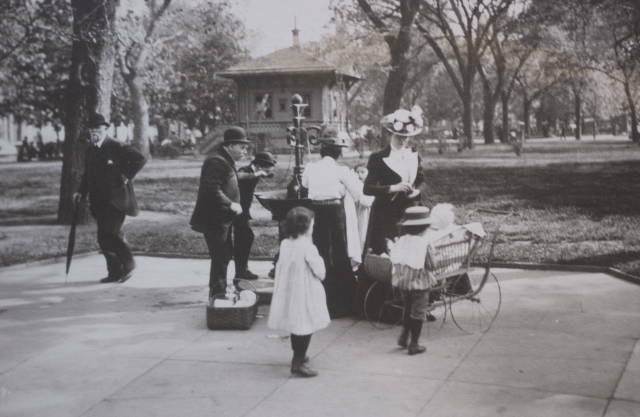 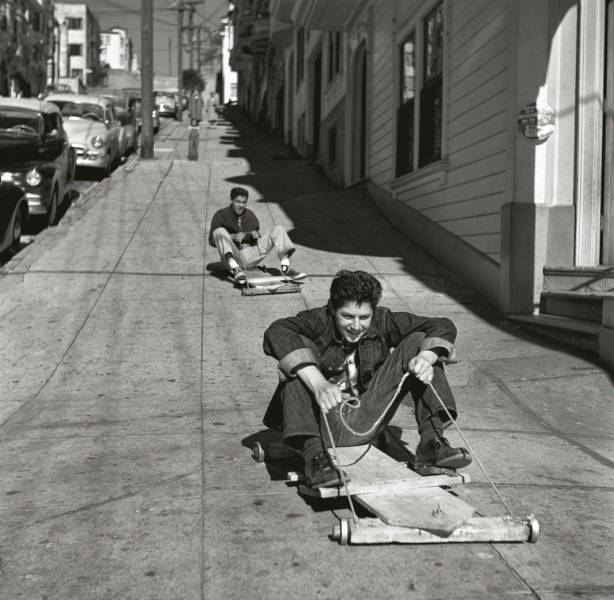 The camera, manufactured between 1857 and 1877 was the first means available to commercial photographers to make enlargements on the then slow bromide paper, using the sun as a source of illumination. 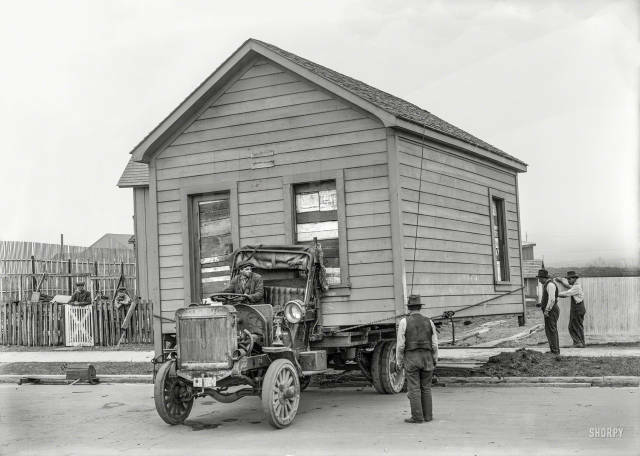 Miss Edna Billings of Racine, Wis., found the camera in a shed near her home while searching for metal for the nation's scrap drive. 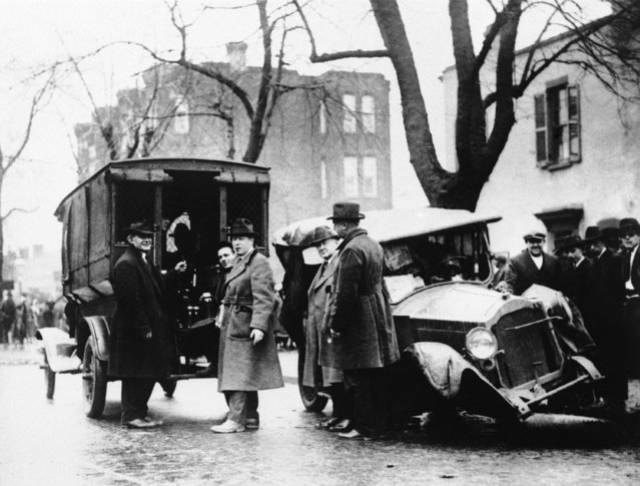 Patrol wagon filled with confiscated moonshine while wrecked car of bootleggers rests by the curb in Washington on January 23, 1922. 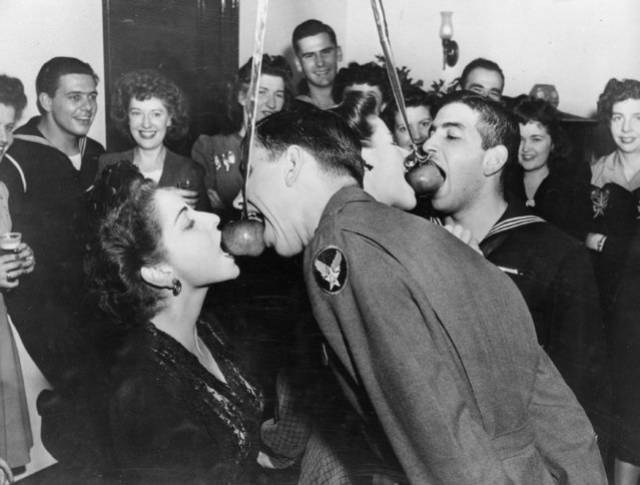 U.S. servicemen bob for apples with their USO hostess companions during a Halloween party hosted by the tenants of a 14-story cooperative apartment building in Beekman Place in New York City, November 1, 1943. 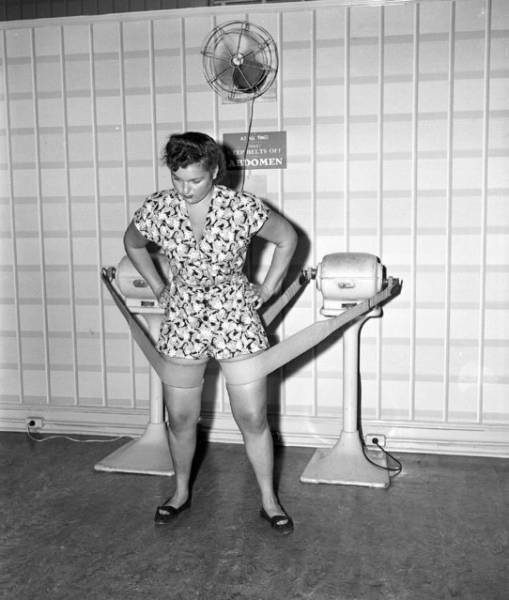 A woman demonstrates the vibratory exercise belt, which can be raised or lowered by using a T-handle, at the Mac Levy salon on November 30, 1946.